We’re happy to announce that we’ve extended December’s GraphGist Challenge until January 31, 2014! This gives you a few more weeks to submit or improve your entries to maximize your chances to WIN a $300 Amazon.com gift card and more prizes for any of the 10 categories. You can win in multiple categories, so feel free to create as many submissions as you like. All entrants will win a Neo4j t-shirt for participating in the challenge. GraphGists are an easy and fun way to develop an awesome graph data model for your apps, document the actual use-cases as Cypher queries and present the resulting data in a variety of ways. 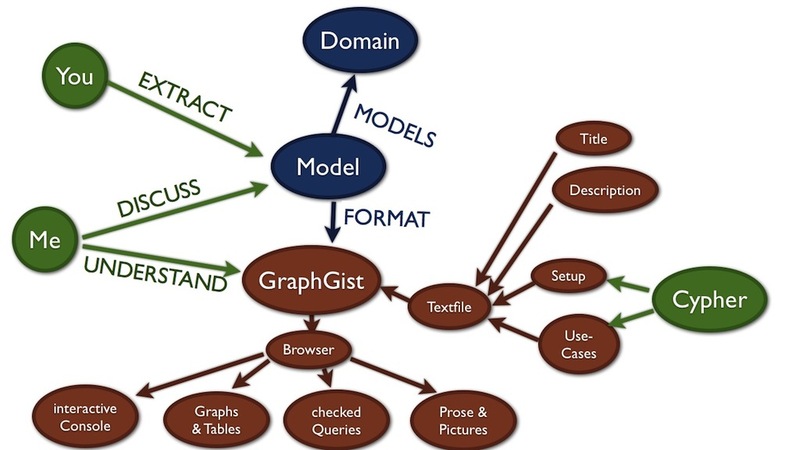 We want to encourage you to model a realistic graphin one of the domains listed below and present it interactively with the appropriate use-cases in a GraphGist. The main goal of this challenge is to provide a large variety of graph applications that can be used by anyone to start thinking in graphs for their domain. The GraphGist collection will be a resource of ready-made examples to help new graphistas kickstart their graph apps. This challenge should also encourageyou , our creative Neo4j community to hone your graph data modeling skills and bring them to the next level. A GraphGist is simply a text file with some basic markup for creating interactive graph models just like the official Neo4j online documentation. The GraphGist text file uses AsciiDoc for its syntax and can be hosted in a version controlled GitHub Gist or any other publicly accessible URL. Just input the URL to your GraphGist text file into field on the upper right at http://gist.neo4j.org/ and then see the result rendered as an interactive page in your browser. What is the GraphGist creation process? GraphGists are a easy way to collect your thoughts into an interactive graph model using the power of open source collaboration. It allows you to build a living functional documentation for your apps that you can iterate on, e.g. by using GitHub’s version control. Start by articulating your problem in your domain and then build your demo solution by setting up an example dataset using Neo4j’s Cypher query language. Ask real questions about your sample dataset and record them in your GraphGist. For example, “What users have access to an application?” or “What are the strongest football teams in a division or conference based on historical game results over the last season?” Then translate your real world questions into Cypher queries and see the results rendered live in your GraphGist webpage! Finally, publish and share your GraphGist to the Neo4j community and get valuable feedback on optimizing your model and queries. Why are GraphGists useful for designing a graph data model? GraphGists give you a fun way to start designing and building your application by creating a living functional specification that also builds your backend data model. It also gives you a way to get valuable feedback on your queries from the Neo4j community. Develop your GraphGist as described above, then add the GraphGist-URL to the Challenge Wiki page and tweet out your creation using the twitter button on the page. Make sure that the tweet contains the tags #neo4j #graphgist.